Anxiety in menopause and peri-menopause is very common, affecting around a quarter of women. Peri-menopause is a big transition in a women’s life, and one we are often not prepared for. First of all we just don’t talk about these things do we? So when we start experiencing changes, whether they be body, emotions or mind it comes as a bit of a surprise. Getting the right kind of support can be tricky. There is an absolute plethora of information on google but how to know what is right for you? Fluctuating levels of estrogen affect our mental emotional wellbeing, and can leave us feeling anxious, panicky or depressed. The good news is that this is just a transitional phase. As our adrenals and other parts of our body take over the bulk of oestrogen production, things do start to level out. But what can we do in the meantime? We have many homeopathic remedies to help anxiety and panic. In a consultation one of the key questions I would be asking is : When did it start? If you are someone who has always struggled with anxiety, I would be looking at prescribing a constitutional remedy that matches your personality. If the anxiety started only with menopause I would be focussing on hormonal balancing remedies that are specifically to help the menopause transition. Treatment would also be aimed at nourishing and strengthening your adrenals so they function at optimal levels. We would also look at the other factors in your life that are causing stress and anxiety, your relationships, your work, your feelings about your body, and how to make supportive lifestyle changes. Eating to balance your blood sugar also really helps ! Read about that here. Homeopathy can REALLY smooth out the ups and downs of menopausal anxiety and change. It gets right into the root of things and helps your body to do what it is already designed to. The consultation itself is also therapeutic and gives you a chance to reflect on your life and express your feelings in safe space. If you want to find our more about your situation and whether homeopathy is right for you, book a FREE 15 minute consultation with me. 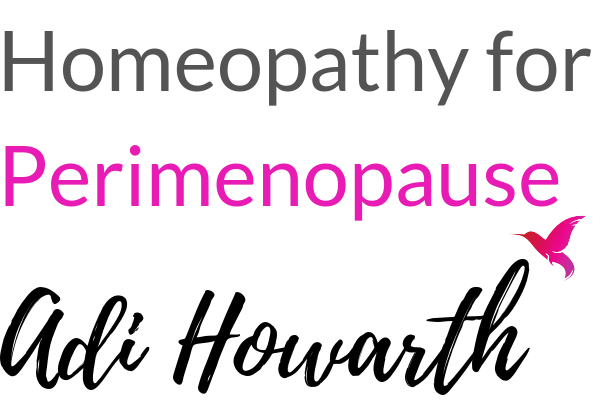 Adi Howarth is a Brighton based homeopath, specialising in peri-menopause and treating people from all around the worlds using Skype/Zoom Calls.